The PDU 400 is easy-to-use with clear audio and intuitive visual prompts to guide the user step-by-step through the rescue process. This single-use unit can provide over 30 shocks and comes complete with integrated electrodes and battery with a 5-year warranty – everything you need to save the life of a friend or family member in one unit. 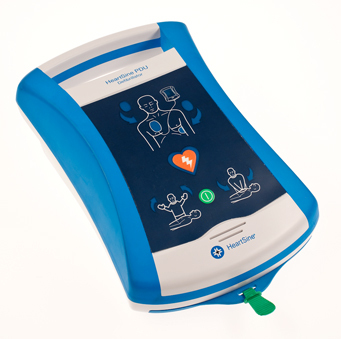 The innovative, single-use technology within this portable AED unit makes it an affordable option for home use. The PDU 400 is a single-use automated external defibrillator (AED) that analyzes the heart rhythm and delivers an electrical shock to victims of Sudden Cardiac Arrest (SCA) in order to restore the heart to normal rhythm. The device delivers a low-energy biphasic waveform which is automatically tailored to the patient impedance such that the same energy is delivered irrespective of that impedance. It is known that the lower the energy required for conversion from Ventricular Fibrillation to Normal Sinus Rhythm, the less the damage to the tissue of the heart and the less likely the patient is to suffer repeat attacks, which formerly might have ensued from defibrillation. However, there is a threshold below which the energy might not be effective. HeartSine has conducted extensive research in an attempt both to increase efficacy and decrease delivered energy. In clinical trials, it has been shown that using a “low-tilt” waveform increases the efficacy of the therapeutic shock and allows a reduction of delivered energy from more than 150 Joules to 120 Joules. A low-tilt waveform is one in which the difference in voltage between the start and end of both phases is on the order of 20 percent (compared to the previous differences of some 50 percent or greater). The results of the clinical trials have shown that with a low-tilt (approximately 20 percent) waveform and a 120 Joule energy, the efficacy of conversion is some 2 percent better than a standard tilt (approximately 50 percent) waveform delivering 150 Joules. This pioneering research was conducted by HeartSine in association with the Royal Victoria Hospital, Belfast.